OYO Sports hit upon an incredible idea in 2011 that is rapidly becoming a huge baseball collectibles sale item. The idea was to produce mini-figures of athletes that were compatible with Legos, K’nex, MegaBlocks, and other building block toys. They are the first building block toy that resembles athletes from baseball, football, and hockey. 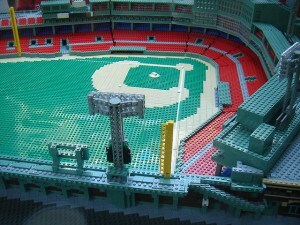 The idea took root a few years back when the founder of OYO went to a Boston Red Sox baseball game. He visited the team store with his kids but was unable to find anything like what they wanted. They wanted a toy. He wanted it to be age-appropriate. So, the company was founded in 2011. Major League Baseball was the company’s first license for these toys. OYO baseball figures were introduced at the World Series in 2011. Since then, they have added football and hockey, as well as other sports affiliations. The mini-figures are aimed at kids ages 6 and above. OYOs have real-life characteristics such as knees that bend, forearms that rotate and they can hold a ball, bat, or stick. Nothing like this had been developed before. One of the great things about OYO is that the company can be very flexible. Since all of the figures are designed and manufactured at company headquarters in Acton, Massachusetts, they can put out a new version of an athlete in a couple days. This is very helpful if the athlete is traded or moves to a new team through free agency because a new version, in the new uniform, can hit the market quickly. Via the OYO Sports website, you are able to purchase many individual ball players as well as team mascots. Team and game time sets, infield sets, outfield sets, and starter sets are also available. You’ll also find individual players associated with the Baseball Hall of Fame as well as the 2014 World Series and All-Star game. OYO has developed a number of stop-motion videos that utilize the mini-figures, making them “come to life.” It’s a great tool for marketing these figures. One such video shows the top ten moments in the career of Derek Jeter. Another, shown below, captures the highlights of the 2014 World Series. You’ll find a number of these videos on YouTube under OYO Sportstoys. Does your child love baseball (or football or hockey)? Consider a gift of these cool toys. It’s a gift that the kids can enjoy in multiple ways. You’ll find a review of a baseball team set elsewhere on this site. I would love to hear your thoughts on this type of toy. Please feel free to share a comment or two using the comment area below. Seems like just the right age! My 7-year old grandson is constantly playing with his legos. I’ve also discussed OYO’s Game Time Set, which is a great starter set at a medium price. Thanks for the comment. Great post, Allyn! Do you know if they make softball versions of these? Or only baseball? Hi Julie. That’s a good question. At this point in time, OYO does not have any softball versions. They do have contracts with some minor league baseball leagues and also with Little League, in addition to MLB. I’ll search around to see if I can find out anything about their future plans. Boston Red Stockings Cards – What’s Their Value?